Ideal for Beauty Therapists who hold a minimum level 3 or equivalent qualification such as ITEC or CIBTAC and who have been working in the spa and beauty industry for at least 3 years. In upgrading their certification to the world’s most distinguished beauty therapy diploma, therapists need a minimum of 40 hours of hands on practice with CIDESCO tutors and to complete theoretical modules as home study. A CIDESCO qualification benefits the therapist with a worldwide-recognised qualification, highly paid beauty therapy jobs, and better worldwide career 515opportunities. CIDESCO remains the highest qualification in the beauty industry. The CIDESCO Postgraduate course will be offered from November through to end of May. In November, all the materials will be sent online which students can prepare at their own pace including notes for Facial Therapy Module, Body Therapy Module, and Anatomy & Physiology Notes together with Revision Questions & Tests. From December to May we will arrange 10 practical days including mock & final exams from 9.30am until 4.00pm. During the practical days, the treatments are standardised to CIDESCO Level. Cleansing, Skin Analysis, Lash and Brow Treatments, Deep Cleansing, Facial Electrical Equipment, Facial Massage, Mask Treatment, Make-up, Manicure & Pedicure. The project with case history studies is discussed on your first day here and there is an option to complete it at the school with the full-time students. The examination consists of the practical exam and an assessment of a Project with case histories. 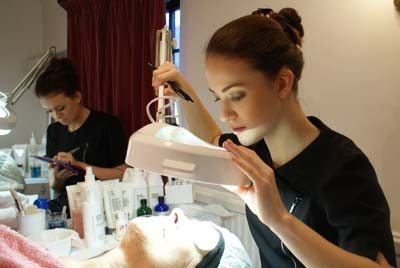 The practical examination of facial and body treatments will take a full day. The theory examination is MCQ and takes 1½hours. ** Students will be prepared to the exam by undertaking mocks examinations for face and body. Work experience in the spa and beauty industry for at least 3 years. Attend an interview with the school principal. *Option to spread the course cost over 12 months. 0% interest - 12 monthly payments of £125.